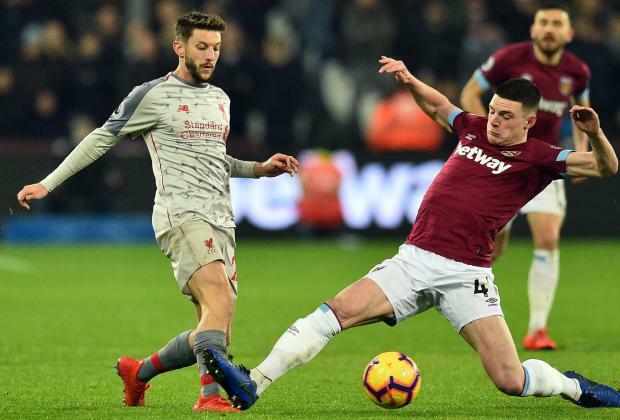 West Ham's Declan Rice (Right) attempts to block Liverpool's Adam Lallana. West Ham midfielder Declan Rice announced on Wednesday that he has decided to submit a written request to FIFA for the transfer of his international registration from Ireland to England. The highly rated 20-year-old was born in London but qualified for Ireland via paternal grandparents and after playing at youth level went on to make three senior appearances, all in friendly matches. "This afternoon I telephoned both (Ireland manager) Mick McCarthy and (England boss) Gareth Southgate to inform them of my decision to submit a written request to FIFA for the transfer of my international registration from the Republic of Ireland to England," Rice said in a long statement on his Twitter account. Rice said he considered himself to be of mixed nationality. "I have equal respect and love for both England and Ireland and therefore the national team I choose to represent is not a clear-cut, simple selection," he said. "Particularly not for a young lad who never dreamed of being in this position.